It is interesting to see the virtual blackout on European TV about Greek protests turning increasingly violent. As the world has started a discussion about the role of journalism here is a good example that omission of facts is still one of the most widely used tricks in the business. Now here's a quiz: Which of the 2 following videos has not been seen by EU politicians? Isn't Greece a peaceful country, is it? You may change your opinion after the jump. Unhappy with the current deadlock in talks about a Eurozone rescue, Slovakia will be going to develop a plan "B" that would see the country abandon the Euro. According to a report from EUobserver parliamentary speaker Richard Sulik said that such a plan would ultimately lead to a return to the Slovak Koruna. Slovakia, which joined the eurozone last year, should have a 'plan B' to return to its national currency, the country's parliamentary speaker, Richard Sulik, has said, amid frustration over the way the eurozone is handling the debt crisis. "The time is ripe for Slovakia to stop blindly trust in what eurozone leaders say and prepare a plan B. This is the re-introduction of the Slovak koruna," Mr Sulik said in an opinion piece published in the bussiness daily Hospodarske noviny on Sunday (12 December). He added: "As we are a country too small to significantly influence EU action, we must at least protect values created by the people living in Slovakia." Little Austria's banking world moved on the global financial radar overnight. Bloomberg reports on a 44.65€ billion lawsuit against Austrian Sonja Kohn, her Medici Bank (under state curatorship since Jan 2, 2009), Bank Austria and parent UniCredit as well as 53 other defendants. It seeks a payback plus RICO damages, as Kohn is suspected to be the mastermind of an Austrian feeder scheme for Bernie Madoff's biggest Ponzi scheme of all times. Before I am going to have a serious discussion with my stylist about my next multi-billion hairdo I am at least happy to have found the answer to the question about whether to rob or incorporate a bank. As it appears to the outsider Ms. Kohn has managed to pull off the biggest banking heist in Austrian history, funnelling potentially 7.57€ billion to confidante Madoffs Ponzi. 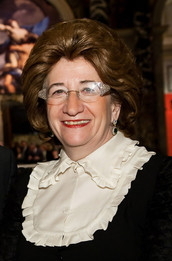 The lawsuit filed by Court-appointed trustee Irving Picard says that her collusion was so pivotal to the fraud that Mr. Madoff tried to destroy evidence of their connection before his arrest in 2008. “In Sonja Kohn, Madoff found a criminal soul mate, whose greed and dishonest inventiveness equaled his own,” said Picard. Kickbacks included a €405 million payment shortly before Madoff's bust, indicating a close 23-year friendship with Bernie Ponzi Madoff. Talk in Vienna has it that this will develop into a feast for lawyers as duped investors include a good part of Austria's upper crust, Vienna's Jewish community and even many bankers themselves. Bank Austria held 25% of Bank Medici, which saw two former government ministers serving on its supervisory board. Denying via her office that she went AWOL last Wednesday Kohn's lawyers have not yet responded to the latest allegations. Kohn had always insisted she was a Madoff victim herself. Breathless but futile discussions about the creation of a new layer of debt in the form of Eurozone bonds are going nowhere. Jean-Claude Juncker, head of the eurozone group of finance ministers, now clashes with France and Germany who both reject the proposal as it would raise their financing costs. On Thursday he said in Germany's main TV news "Tagesschau" that Eurozone governments would have to finance 40% of their debts via Eurozone bonds, which would lead to a northward conversion of German yields with their weaker Euro brothers in arms. 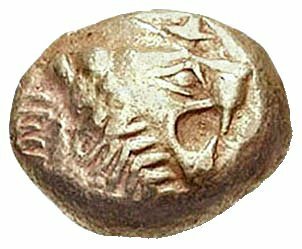 As the Euro dream has rapidly mutated into a nightmare for Greece and Ireland, with Portugal and Spain to follow for sure, I note a fatal tendency in EU circles to hold out for the Endsieg despite all the contrary evidence pointing to a not too distant disintegration of the common currency. The term Endsieg was first coined by immortal social-libertarian Austrian politicial critic Karl Kraus in 1918 - he was the official Austria's pain in the a.. a century ago with his weekly newsletter "Die Fackel" - and was hijacked later by Adolf Hitler's propaganda minister Joseph Goebbels. 'Endsieg'became part of the Nazi doctrine before the ultimate downfall of the Third Reich: Temporary losses (including of civilian lives) notwithstanding, the 'Third Reich' would ultimately prevail, and thus any breakdown in allegiance to Nazi ideology was not to be tolerated. This conjuration of final victory became more desperate in 1943 when allied successes forced Germany onto the defensive. Joseph Goebbels still spoke about the 'Endsieg' as late as March 1945. VIDEO: EU President van Rompuy: "I am convinced that the euro area will come out of the crisis stronger." The Euro propaganda ministry in the European Central Bank in Frankfurt frantically tries to implant the similar wrong belief that all is right with the Euro. What charts do they watch? Maybe they take a look at ActingMan.com whose very nuanced Austrian view of the Euro's death spiral arrives at an entirely different, bleak, picture. National politicians in many EU countries, whose borrowing costs will shoot to unaffordable levels after the first sovereign debt default next year, still appear to draw a complete blank on the severity of the financial crisis that finds its roots in too much credit and too much leverage. The times of cheap debt are over and bond markets have topped out with a high probability. This complete cluelessness is repeated on the EU level. Just follow the MEP's aggregated Twitter feed to have a real-time insight into their thinking - and take your own clues. Mutual political calls that no Eurozone member will default echo the same despair as can be heard in the calls for the Endsieg 65 years ago. The facts speak a different tongue. Over the last several months we have been pondering if governments will come into the silver market. Before we get into that, it is important to note that governments are very different animals and there are over two hundred of them out there. Therefore, it is a very liberal generalization to lump them all together as if their needs, objectives and agendas were the same, thus expecting them all to act in the same fashion for the same reasons, is a big stretch. That said, it's the stigma, the psychological effect, the sentiment and the message it would send to markets that prompts us to group them together in investors' minds as a market force. This same topic has been argued in the gold space for several years and now it has come to pass that central banks worldwide have thrown in the towel and became net buyers of gold. Should it be different for silver? By the way, did you notice, how silver silently became mainstream again and more and more headlines now read "Gold and Silver..." whereas only a couple of years ago silver was nowhere in sight of anyone except the dreaded silver bugs. Much has been made about "manipulation" in gold and, particularly of late, in the silver market. Scores of articles have been written on the subject, and things got as far Washington , DC where CFTC held hearings on the subject. We don't subscribe to the theory, or, more precisely, we don't share the conspiracy context of it. After all, few seem to care about governments' involvement in industry, stock market, banking system, housing, etc. All of that is being done openly and has been for a decades, albeit at a grander scale lately, so why is it a big deal in the silver market? We prefer the term "managed". Markets are managed as are currencies. Silver (as gold) happens to be money, so if all other "monies" are managed, why not silver? It would be native, to say the least, to expect anything different. If something is important to your livelihood chances are you're going to pay attention to it. Well, we are here to tell you that silver is important to governments, has always been, and is about to get VERY important going forward. Government did not decide that silver is money. People - you and your ancestors - did. So why is it a revelation that governments would be involved in the silver market? Didn't you appoint them to manage the monetary system? We're not saying whether it's good or bad. It just is. 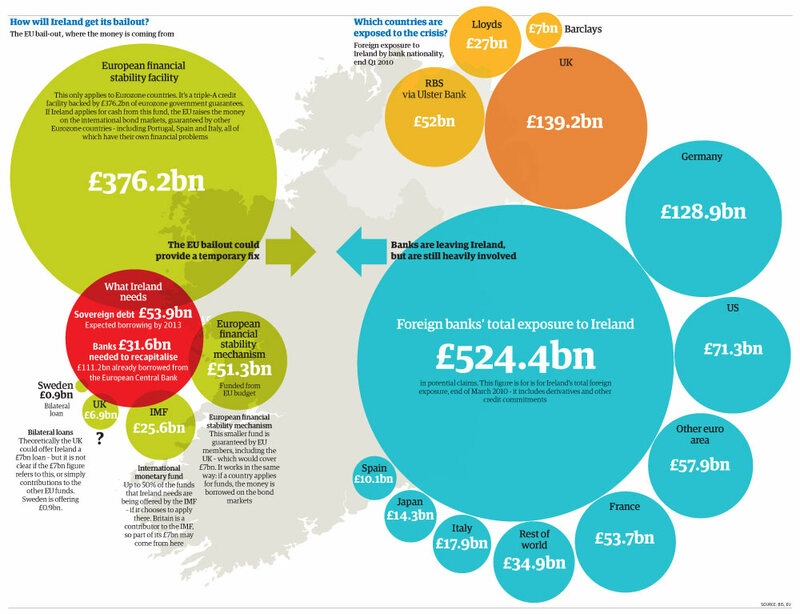 Chart courtesy Guardian. Click to enlarge. As another proof that EURUSD swings are merely a race to the bottom, China and Russia decided to boot Federal Reserve Notes (FRN) in bilateral trade. The move is designed to achieve a significantly bigger world market share in the currencies of the 2 countries. 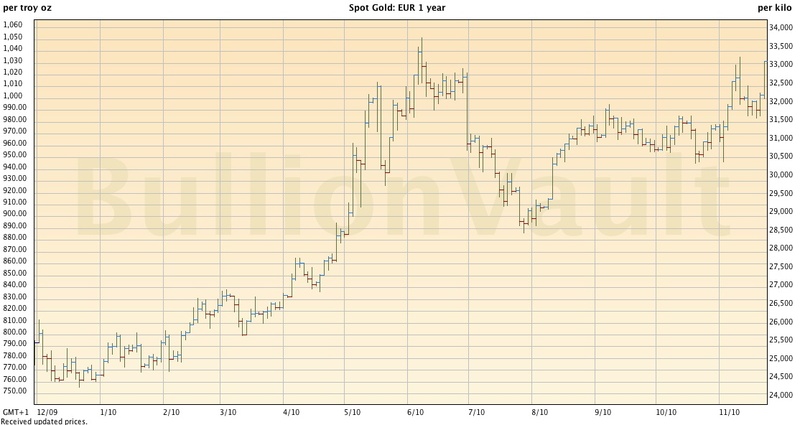 Gold may be set for major break-out as the preying eyes of Eurozone investors turn from Ireland to Portugal, where spreads reached levels last seen in Greece before the EU/IMF bailout. The yellow metal rose 3% to €1,031 per ounce in the last 24 hours. We are likely to see new record highs vs. both the $ and the € once gold clears the €1,050 handle again, proving a capital flight from all major fiat currencies. This makes it clear that the winner in the currency wars will be the universally accepted currency of the last 2,800 years one more time again. Fiat Currencies are not floating. They only sink at different speeds. 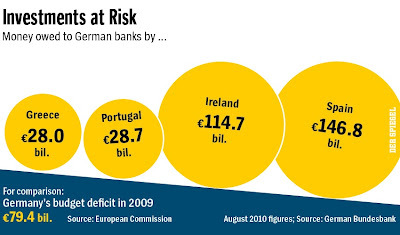 The Eurozone has another problem. 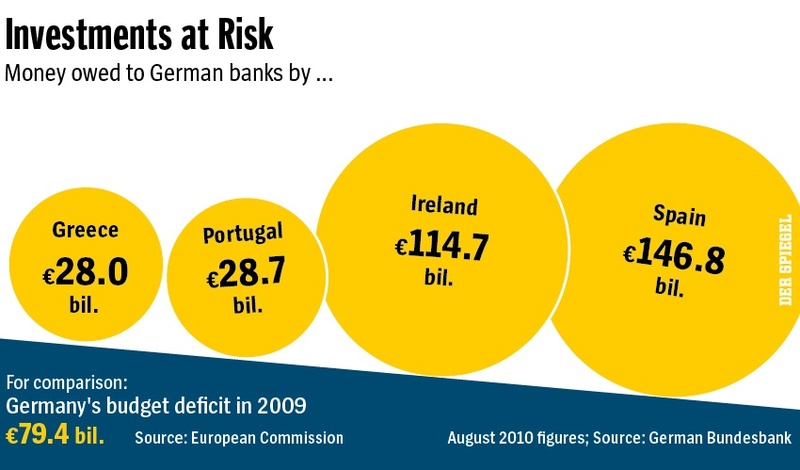 While media attention focuses on Irish bailout talks, the Greek tragedy is about to bubble up again. Following the publication of upwardly revised deficit figures for Greece, Austrian Finance Minister Josef Pröll announced on Tuesday that Austria is going to withhold a €190 million payment to Greece in December, citing unsatisfactory data and lower than projected tax revenues on behalf of Greece. "From the current set of data we have there is no reason to release the December tranche from an Austrian perspective," Pröll said according to Austrian media reports before he left for Brussels. Greek CDS widened to 980 basis points after Pröll's statement, albeit there were no offers. China and the USA: They are not enemies but frenemies with dependent economies. Looking at the graph below, depicting year-to-rate price rises in commodities, I am only left with one question: If almost everything rose 4% and much more, how can this funny US Consumer Price Index be at only 1.1% annually? 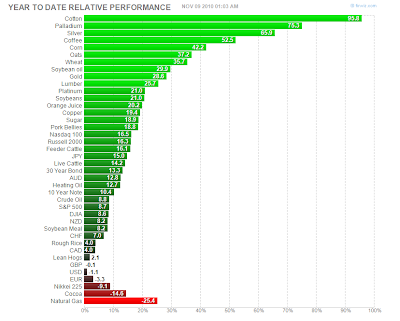 Something's got to give here and I bet it will not be commodity prices. Silver's sky-shot to a new 30-year high of $27.73 per ounce has led to a new phenomenon in Germany. For the first time in history it is theretically possible to buy two last series of silver coins with a denomination of €10 and a silver content of 0.535 ounces for less than the silver equivalent. According to a report in German Daily "Welt" the soaring silver price has forced the German government to bring forward the starting time of sales of the 2 commemorative coins into October to save face. The coins now have a value of €10.66 but have to be sold at the denominated Euro value. As this story is widely circulating in Germany it can be expected that these coins will be sold out by tomorrow. Germany's time on a theoretical silver standard - the country was on a bi-metallic standard before the Weimar Republic in the 1920s - won't last long, though. In order to counter soaring silver prices and keep the denominated value below the silver value the country has announced it will reduce the silver content to 10 grams or 0.3215 ounces in its commemorative silver coin line from January 2011. Reuters has written up this handy timeline of gold's history as a currency going back to 1,500 BCE. This Lydian coin depicted to the left was the first bullion coin and weighs 4.71 grams, has a diameter of 13mm at its widest, and at 4mm, is thick as a nugget. It likely consists of about 55 percent gold, 43 percent silver, 2 percent copper, and trace amounts of lead and iron. 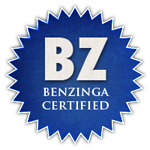 It trades between $1,000 and $2,000 in numismatic cercles and has never devalued to zero purchasing power. An interview with German Finance Minister Wolfgang Schäuble guarantees an entertaining week with wild FX swings. Schäuble bashes not only Ben Bernanke's QE2 in German weekly "Der Spiegel" but also lambasts Treasury Scretary Geithner for blaming Germany's trade surplus for America's economic woes. The World Bank dropped another bombshell, essentially recommending a Bretton Woods 3 with gold as a "reference point" for valuations. 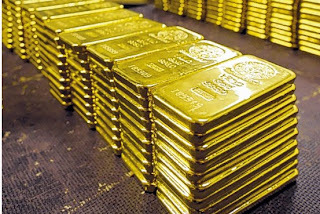 Read on to find out why a gold standard would be the last life ring for the ailing dollar and could see the USA and several European countries as the winner in the coming real currency war between gold and fiat money. The German export successes are not the result of some sort of currency manipulation, but of the increased competitiveness of companies. The American growth model, on the other hand, is in a deep crisis. The United States lived on borrowed money for too long, inflating its financial sector unnecessarily and neglecting its small and mid-sized industrial companies. 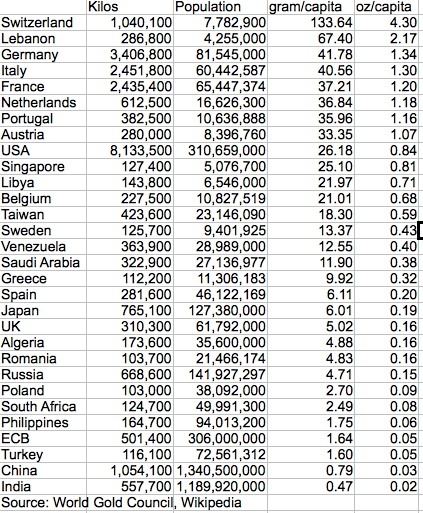 There are many reasons for America's problems, but they don't include German export surpluses. I seriously doubt that it makes sense to pump unlimited amounts of money into the markets. There is no lack of liquidity in the US economy, which is why I don't recognize the economic argument behind this measure. Schäuble may be right that US corporations sit on cash hoards, but QE2 will flow exclusively into Geithner's revival of Weimar economics in his desperate effort to save Wall Street. Morgan Stanley noted immediately after the announcement of QE2 that the "money" is earmarked to support Treasuries almost all along the curve. 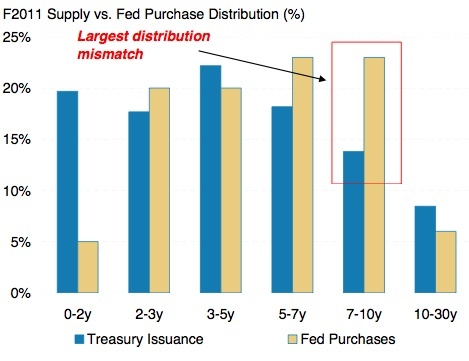 The chart implies that investors shun longer dated maturities, realizing that record low yields do not fit into times of a crumbling US economy. GRAPH: The Fed will bolster 5- to 10-year maturities, essentially buying all the net issuance of US government debt. Chart courtesy Morgan Stanley. In terms of Ponzinomics the Fed does the right thing in trying to create a financial perpetuum mobile based on ever expanding credit: The Treasury prints bonds which it exchanges for the "money" the Fed prints. As long as everybody believes in the illusion that it will work; it will. I doubt it though, as history lacks a successful example where a nation printed its way out of debt. 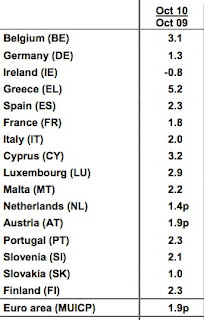 QE2 can also be seen as an attempt to hold down risk premiums i.e. interest rates. The coming wave of government bond issues in what is wrongly called the 1st world will guarantee a yield race to the upside as investors will emphasize the risks in their buy-side analysis. One does not need a calculator to see the disparity between a disastrous financial environment on both sides of the Atlantic while interest rates hover at record lows. 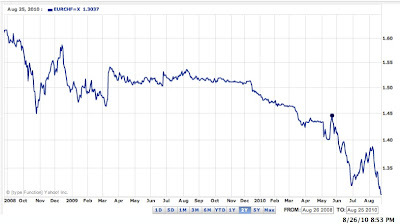 Recent explosions in Greek and Irish spreads are only an appetizer of what is to come next year. The Wall Street Journal has this number of the week. Word has probably gotten around that the Federal Reserve will buy another $600 billion in US Treasuries in the next 8 months. This figure coincides with the net issuance of US debt and is proof that the USA will go the way of the Weimar republic which is the most famous example where a country tried to substitute dwindling revenues with money fresh off the printing press. What is different this time is the circumstance that the USA's downward spiral finds an equal counterpart in Europe. Both Federal Reserve Notes (FRN) and the Euro will continue their race to the bottom against that 2,800 year old international currency aka gold. As the Fed's holdings of total domestic debt will grow to $2.6 Trilion or roughly one fifth of GDP, Ben "Weimar" Bernanke has shifted into the next gear of Ponzinomics where a system can only be kept alive by continuously growing. 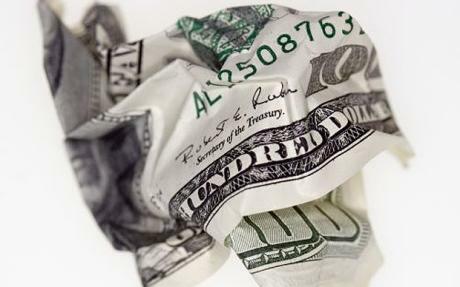 Stop the inflow of fresh money and it will collapse. It has never been different in history. As QE2 confirms expectations that the Fed will continue on the path of monetary inflation the USA will find itself beyond the point of no return. Now the question shifts to timing the inevitable as only one thing in QE2Infinity will change: the zeroes. 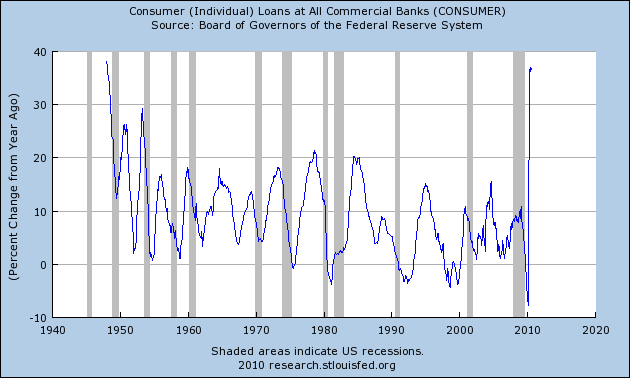 We are now in the 4th year of the crisis, taking the subprime meltdown in August 2007 as a starting point. Adding in the political factor that the result of US midterm elections effectively guarantees a political stalemate there is not much hope for any meaningful reforms that would lead to a path of more sustainable budget deficits and a deleveraging in the banking sector. Bernanke now has added another $600 bilion to the debt balls he already juggles. Once foreign investors will demand higher yields for increasingly risky US debt it is very likely he will not be able to keep them all aloft. VIDEO: Remember The Last Run On The Dollar? History repeats itself. It only gets more expensive with every time. Watch this video (h/t @fiatcurrency) on the turmoil 30 years ago when OPEC members withdrew a mere $5.5 billion in money market funds, sparking golds vertical move to $850. This time not even $5.5 TRILLION will help if institutions like JP Morgan sit on $45 Trillion in derivatives. And you still think there will be any other end to this than an unorderly unwind, to say the least? Think again, the flicker of bad headlines looks increasingly as history will repeat itself again. 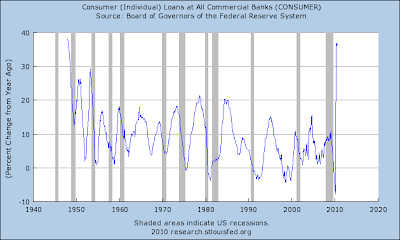 Remember, we are now in the 4th year of the financial crisis and there has not been a single measure of regulation that has gone into effect. Derivatives? Not a single step taken! Hedge funds? EU regulations will come in 2018! Banks? Basel 3 will set into motion in 2019! But we have a crisis TODAY! Those responsible for the crisis are still in office! Why? Austria was only rated AA+ by Chinese Rating Agency Dagong, Bloomberg reported last week. Note the focus on decreased financial strength. Dagong Global Credit Rating Co., the Chinese firm seeking to become an alternative to Standard & Poor’s, Moody’s Investors Service and Fitch Ratings, graded Austria’s government debt lower than that of Hong Kong. 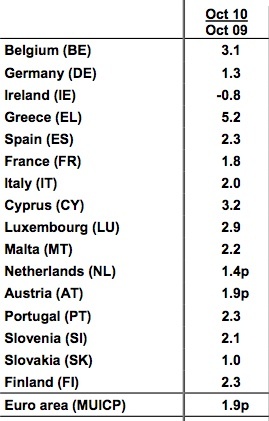 Austria’s "financial strength has noticeably decreased. The export destination structure which relies heavily on the internal market of the eurozone encumbers its economic growth," Dagong said in the statement. 20.10.2010. Mark this date red. It will be historically regarded as the day the concept of the European Union (EU) started dying. The old continent gets engulfed in protest waves that span from Portugal to Romania and will soon reach probably every member state with the exception of micro-sized Luxembourg once the public receives more information on austerity cuts in the 2011 budgets. 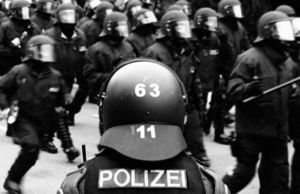 The situation is now getting hairier with every day and it exceeds this blogger's capacities to list all stumbling blocks on the way to a kind of European Orwellian integration envisioned by its leaders, but increasingly resisted by the sovereigns. I once started this blog to be 5 years ahead of Moody's to ask whether the US' AAA-rating was in jeopardy. It was an easy world then. All you had to do was to lip-read Alan Greenspan's mysterious descriptions of markets to arrive at the conclusion that gold had only one way: upwards on the back of the decline of today's major fiat currencies. Today's bullet points in OpenEurope's daily email digest of Europa discordia would have yielded several blog posts then. This is beyond the capacity of a single blogger. a Spanish municipality, meanwhile, has become the first to suspend payments to its debtors. 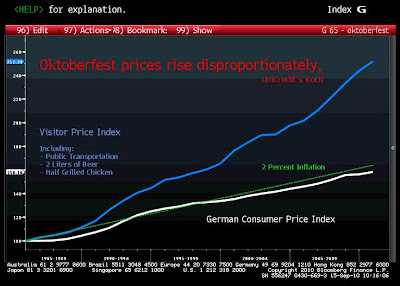 Here is one more proof that deflation (of asset prices) and inflation (in all the stuff you buy in everyday life) can exist at the same time and that official inflation figures are probably more of a kind of crapshoot than any economist wants to admit. 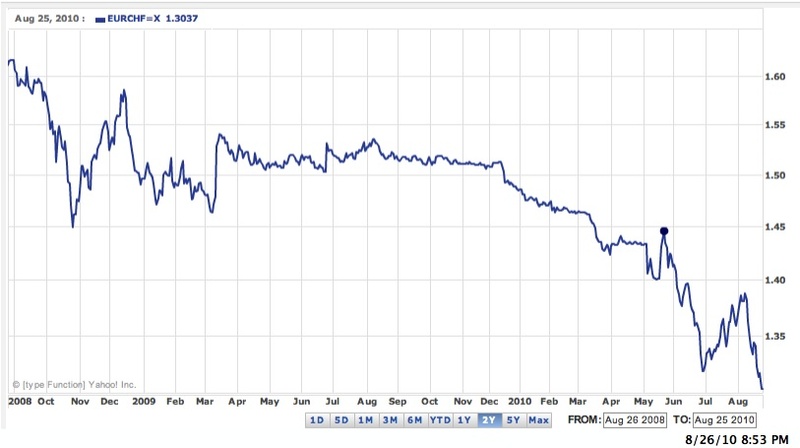 Hat tip goes to @fiatcurrency who published this chart via Twitter. 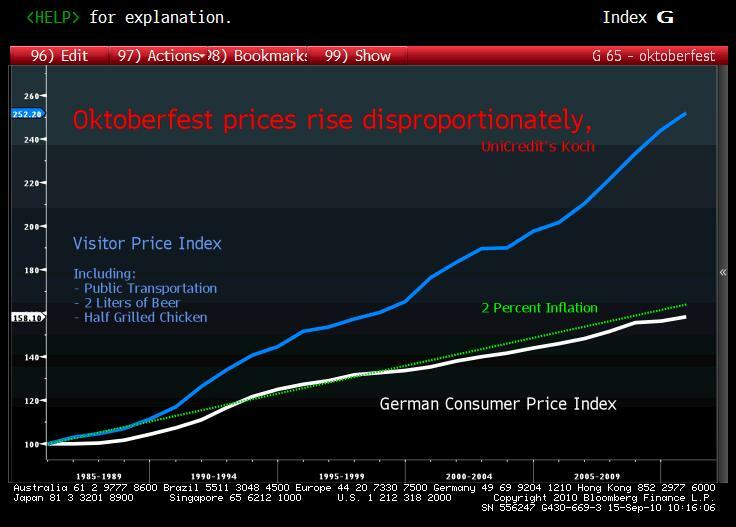 As I put a lot more trust into the business sense of Oktoberfest caterers than into funny official inflation data that gets contradicted every time I stop at the gas pump, eat in a restaurant or need state services I presume this Oktoberfest data reflects the true cost of living i.e. the true davaluation speed of fiat currencies much better than the data we are being fed by authorities. Citibank Favors Euros - Escape Into Gold! Exactly for this reason I am not buying in Citibank's Wednesday FX alert by John Englander that states 9 reasons to go long Euros (my opinion in bold italics). More than 95 respected economists, academics, analysts and market commentators are of the firm opinion that gold will go to $2,500 and beyond before the parabolic peak is reached. In fact, the majority (55) think a price of $5,000 or more - even as high as $15,000 – is actually more likely! As such, just imagine what is in store for silver given its historical price relationship with gold! Gold went up 24% in 2009 and is up 16% YTD and, as such, there are no shortage of prognosticators who see gold going parabolic reminiscent of 1979 when gold rose 289.3% in the course of just over a year (from a $216.55 closing price on Jan. 1, 1979 to a closing price of $843 per ounce barely a year later on Jan. 21, 1980) and 128% higher in a late-1979 parabolic blow-off of just under 11 weeks! A 289% increase in the price of gold from $1275 would put gold at $4,960. (More on what that might mean for the future price of silver is analyzed below.) That being the case what appear on the surface to be rather outlandish projections of what the bull market in gold will top out at don’t seem quite so far-fetched. Silver has proven itself, time and again, to be a safe haven for investors during times of economic uncertainty and, as such, with the current economy in difficulty the silver market has become a flight to quality investment vehicle along with gold. The 49% increase in silver in 2009 (and 23% YTD) attests to that in spades. During the last parabolic phase for silver in 1979/80 it went from a low of $5.94 on January 2nd, 1979 to a close of $49.45 in early January, 1980 which represented an increase of 732.5% in just over one year. Such a percentage increase from the current price of almost $21 would represent a future parabolic top price of $175. (For what that might mean for the future price of gold see the analysis below.) Frankly, such prices seem impossible in practical terms but that is what the numbers tell us. How both gold and silver perform, in and of themselves, does not tell the complete picture by a long shot, however. More important is the price relationship – the correlation – of one to the other over time which is called the gold:silver ratio. Based on silver’s historical correlation r-square with gold of approximately 90 – 95% silver’s daily trading action almost always mirrors, and usually amplifies, underlying moves in gold. With significant increases in the price of gold expected over the next few years even greater increases are anticipated in silver’s price movement in the months and years to come because silver is currently seriously undervalued relative to gold as the following historical relationships attest. Over the past 125 years the mean gold:silver ratio (i.e. 50% above and 50% below) has been 45.69 ounces of silver to 1 ounce of gold. Interestingly, during the build-up to the parabolic blow-off in 1979/80 silver outpaced gold going up 732.5% vs. gold’s 289.3% causing the ratio to drop from 38:1 in January 1979 to 13.99:1 at the parabolic peak for both metals in January, 1980. Emerging plans to install a EU Treasury that can issue supranational debt among plans for stronger economic cohesion in the EU are met with heavy flak from many sides while the Union faces continuing strong headwinds from a languishing economy and persistently high unemployment. The planned debt issuing agency also strives for higher fiscal reintegration, an issue destined to fill many heated discussions among the EU strongmen France, Germany and the UK. Yves Leterme, the Belgian prime minister and current holder of the rotating EU presidency, plans to propose a new machinery to prevent a repeat of Europe's sovereign bond crisis. "This should evolve into a European debt agency able to issue debt for all member states. Everybody will gain from the mechanism," he said at the annual Ambrosetti conference of global policymakers at Lake Como, Italy. 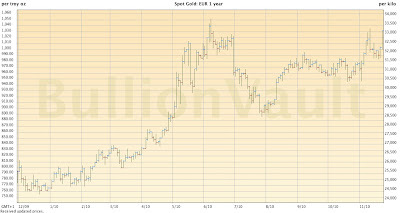 The idea would be the next logical step beyond the eurozone's €440bn bail-out fund agreed in May. "This will be a very effective tool to harmonise budget policies, but the way ahead may be very tough," he said. Germany is likely to balk at talk of an EU debt union, or "Transferunion" as it is described in Gothic terms by Germany's tabloid press. While the dear European leader did not mention where the money for this EU Treasury will come from - even a debt issuing agency needs some - readers may be reminded that the EU has begun to ask for new taxes to raise money for its budget plans. So far the EU is primarily financed from a share of member states VAT income. One idea for direct EU taxes is the hotly discussed banking tax and I can remember that carbon taxes may become a viability too. We can expect politicians to be most creative when levying new taxes on an already heavily strained populace. Leterme is not the ideal person to talk about further European integration plans anyway. Over the weekend Belgium officially abandoned coalition talks, renewing calls for a division of the country along ethnic lines. This integration stuff does not even work at the the very heart of the EU in times when countries find out that future financing needs will evolve into an interest rate competition among member states. A EU Treasury will not help either. If all this sounds like a Deja-vu to you, relax. It is a different country. Several groups are up in arms over a proposal to cut housing loans by 10% from the current cap of 90%, saying that the move will only discourage Xxxxxans (NOTE: redacted -:) from buying houses. National House Buyer’s Association (HBA) and Federation of Xxxxxian Consumers Associations (Fomca) cautioned that the proposed home loan reduction to 80% would only be a burden to potential house buyers. HBA honorary secretary-general Chang Kim Loong said the proposal would go against the Government’s plans to encourage home ownership. Hundreds of Afghans have been trying to withdraw money from the country's largest bank, amid concerns that it could collapse. The panic was sparked by reports that Kabul Bank has lent millions of dollars to members of the political elite, who used the money to make risky investments. A slew of reports has come up with allegations that relatives of Afghanistan's leader Karzai and executives of the bank have sunk 100s of millions of Federal Reserve Notes (FRN) into Dubai and other property investments before prices took a sharp dive.